We had this requirement recently with one of our clients. They had a change in their business processes and from team based security, they wanted to move to region based security. What they wanted from us is to migrate their Users to specific Business Units based on regions. So they had five region which they set-up as Business Units. And they had around 600+ users who needs to be put under the respective business units (regions). So we quick developed a data migration utility to do the job for us. The data migration utility would basically read from an excel file the user and their regions and then move the user in CRM to the appropriate business unit. When the business unit changes, we all know the security roles gets lost. So the utility also took care of the fact that it re-assigns the security roles to the user after the business unit of the user has changed. So far so good. After data migration happened everything worked great. We verified the roles and business unit of the user and everything was fine. However to our horror, the business of the customer complained that they were getting emails from CRM which they were not supposed to. And hence I was there again trying to find out what is causing the issue. After rounds of debugging we found that there is a specific functionality in which email is triggered to the manager of an employee. The manager was set-up in CRM using the OOB Manager field. So what really triggered the wrong emails? Well if you change the business unit of a user in CRM, the following are the effects on the manager field. 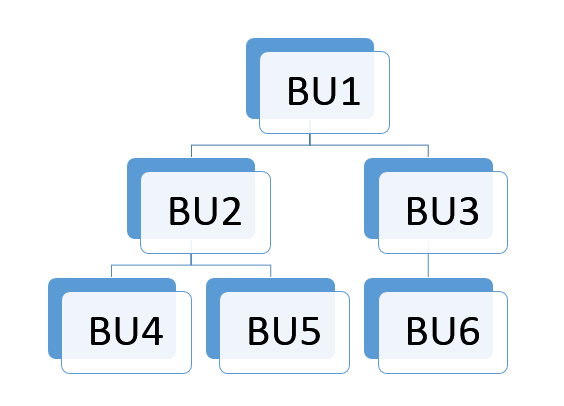 If the manager is in a business unit which is neither the same nor the parent business unit of the user, the manager of the user would be automatically changed to someone above the hierarchy. For example – Say the following is the business unit structure. And say we have three users (user1, user2 and user3). Say before migration this was the org structure. Now as per the data provided by the customers, both User2 and User3 should be in the same new BU. say in our example it is BU4. The problem that happened is the order in which the users got migrated. So User2 (manager of user3) was first in the list. So when we migrated User2 to BU4, the manager now belongs to BU which is in the lower hierarchy than the reportee’s BU. So what CRM did is, it re-assigned the manager of the User3 to User1 (belonging to BU1) automatically behind the scenes. And this totally resulted in multiple wrong manager set-up and hence the wrong emails. So if you have a requirement where you are needed to change the BU of the users, please do remember the effect on the manager field also. Also luckily we did not have manager hierarchy enabled for our customer. If manager hierarchy would have been enabled, this kind of wrong manager set-up would result in security breach as well. There are many topics on optimizing the performance of the reports in Dynamics CRM. And it has been discussed so many times about the performance of filtered views. However no matter how much we try, we have to use filtered views for the security context of the report. And here I was called for to optimize the performance of another such report which uses filtered views. The report was constantly timing out. The report was basically a join of the FilteredOpportunity with around 10 master data entities and around 5 filter operators. And the total opportunities in the system were around 1,50,000. So I had to optimize the report for the maximum possible records to be returned. I have to use filtered opportunity view but how do I minimize the performance effect of it. And while I was thinking, suddenly a trick came to my mind. The query completed in 2 minutes and 35 seconds. Then I ran the below query. And voila!. The query returned the results in just 8 seconds. The reason is because the primary key column of a table is clustered index and the fetch on just the primary key would be very fast compared to the fetch of the other columns from the view. I replaced FilteredOpportunity with the Opportunity entity view. And joined the Opportunity with the @OPPS table on the opportunityid column. Off course to retrieve the names text values of the option set and all, I had to join with the String Map table but after I constructed the query and ran the report, it consistently executed within 30 seconds even with the maximum set of data. 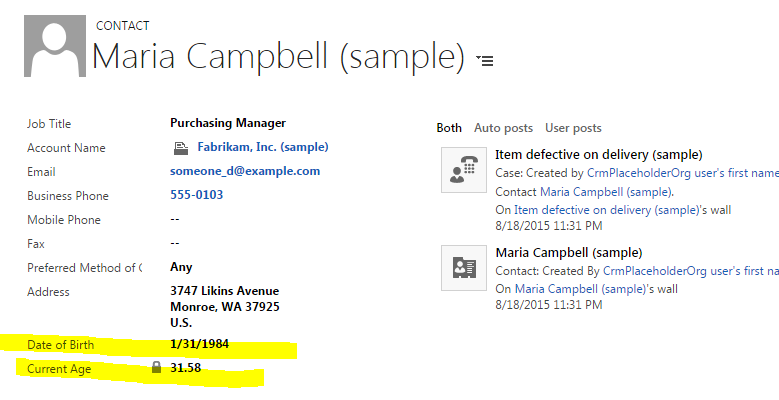 Hope this helps when you face the same problem while you develop SSRS reports in Dynamics CRM. Switch business process programmatically in Dynamics CRM based on business logic during create of a record. Confused by the title? Well let me explain here the exact requirement that I had recently for one of my customers. For the opportunity entity we designed multiple business process flows. However the condition was whenever a user tries to create a new opportunity, first a default business process flow would load. Depending on the data entered by the user, based on business logic as soon the record saves, the record should switch to the appropriate business process flow. So it’s pretty obvious how we would do it. On the save of the form, we would check for the data entered by the user and determine the business process. After the record is saved successfully we refresh the entire form, so that the appropriate process loads. Simple isn’t it. But there are two triggers we need to handle here. Pre-Save of the record – To determine the business process to be set for the record. Post-save of the record – To reload the form. For the first point, we can easily register a function on the save of the form. However if you do that there is one catch to it. The OOB save button click is synchronous and you cannot register any event handlers on successful completion of the save. So we need to approach this approach differently. Off-course there must be many other good ways to achieve this, but the following is way how I approached the same and it worked great. Create visibility rules so that OOB Save is hidden during the create mode and the custom Save button is visible. Register a function on the click of the custom ‘Save’ button. Determine the processid the stageid as per the data entered by the user. Set the processid and the stageid using Xrm.Page.getAttribute(“processid”).setValue(processid) and Xrm.Page.getAttribute(“stageid’).setValue(stageid). successCallback – The method to call after the save is called. errorCallback – The method to call if the save fails. In the successCallback method write the code to refresh the form. So the form would be refreshed and the appropriate business process and stage would be loaded. Yes, I saw exactly the same line in the draft customer requirement sheet. My prompt reply would have been ‘No’ to the customer for this requirement. But as a consultant, we all know the perils of saying a direct ‘No’ to the customer. 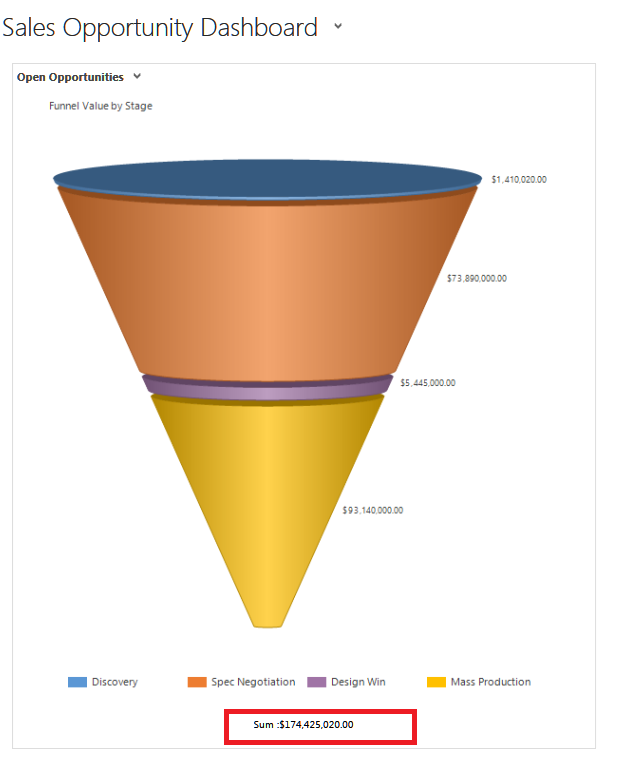 To be specific to the requirement, we had a dashboard showing a funnel chart for opportunities with opportunity estimated value for different stages. What the customer wanted to show a sum of the values for all the opportunities just below the chart. As usual, we tried to propose them so many alternatives but customer was adamant to having the solution the way they wanted. So here I was scratching my head over the internet trying to find a possible solution, preferably OOB to achieve the same. However to my disappointment I could find anything. So I decided to try it all out myself. So here is the approach I followed to achieve the same. Before you move ahead and read the solution, one thing to let you all know. The below steps are all unsupported customizations and might not work with a future update for Microsoft CRM. So if you are reading this line, you are also on the same boat as I am . So without wasting further time, let us jump to the solution straightway. Create a HTML web-resource and place it in a section on the dashboard with the minimum width and height possible so that it does affect the appearance of the dashboard. The purpose of this web-resource is to read the funnel chart when the dashboard loads. // get the dashboard frame. // get all the iFrames under the DashboardFrames. // get the crmchart element. 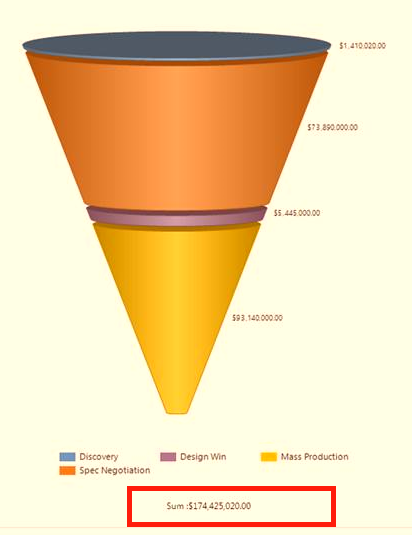 Chart: funnel value by stage: This is basically the title of the chart. If your chart is showing some different title, you should use the same title here. Now when you publish your dashboard you should see like below. And when you enlarge it, below is the screenshot. P.S – This will work only when you view the chart from the Dashboard. However if you open this chart from the context of a view, it would not work. Thanks everyone for the huge downloads and making the tool so popular. Please visit the link https://rolebasedviews.codeplex.com and go to ‘Downloads’ section and download the release – Role Based Views – CRM 2015 Version. Please download both the managed solution as well as the executable as using the new version of the managed solution with the old executable would give an error. New to the tool? Please check for the Documentations tab at https://rolebasedviews.codeplex.com to learn how to use this tool for your need. P.S – This version involves some schema changes in the configuration entities used by the tool and installing the latest version on top of the previous versions might not work properly. So if you are already using a version of this tool its best to uninstall the old version and install the new one. However if there are lot of configurations that you have done already and do not want to loosed the data by uninstalling the solution, here are steps you need to follow. You should be logged in as administrator to perform the below steps. Login to Advanced Find and look for the entity – ‘Role View Configuration’ and select the Active View. Once you view the results, couple of changes you need to make. A new field called ‘View Id’ (schema name – rb_viewid) has been introduced in the entity. If you have the ‘View Name’ field populated for a row, you need to fill the ‘View Id’ field with the GUID of the ‘View Name’ field value. Reach out to me at debajit.prod@gmail.com for any issues. First of all, from the title this seems trivial isn’t it. After all as CRM consultant we do so many complex stuffs and calculating the age of a contact is just so simple! 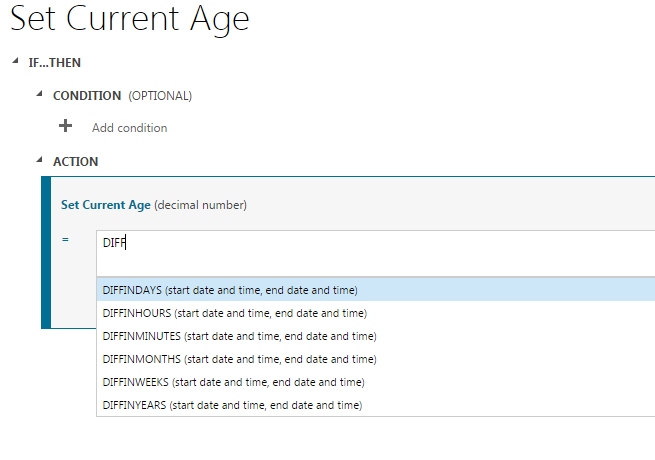 However the point I wanted to highlight here is to use the DIFFINDAYS and host of other functions introduced in Business Rules editor and what can be more interesting than demoing it by automatic calculation of age which is so often required. First things first. Fields like ‘Age’ of a contact or anything which increases year or year should be calculated and how many times I have seen in implementations that this field is set to numeric with free text entry. So please remember that if you have any requirement like this, please mark the field as read-only and it should be calculated based on some other field value. So we have made the field read-only. If you are thinking wouldn’t it be nice if this field is auto calculated also, then you are on the correct way pal. So we make the field auto calculated. We can set up this field and make it a calculated field. I have done the same. Please check for the screenshot below. Please note here that I have kept the age field as Decimal because my requirement was to show in fraction of years. However you can keep this whole number also. Now comes the fun part. I click on edit and the editor opens up. I set the age as show in the screen shot below. Please note that I have created another field called ‘Date of Birth’ based on which the age is calculated. The two important functions you can notice here are DiffInDays and Now(). These functions have come up with the 2015 Online update 1 release. Now you save and close out this field. Now when you enter the Date of Birth, the age calculates automatically. So no more marking the field read-only and writing jscript/ plugin for calculating the age. All this is handled automatically once you set the field as calculated in CRM. This is just one example. You can explore a host of other functions introduced and use it to your liking.